How can something so simple be so good? Because simple is always best when it comes to food. 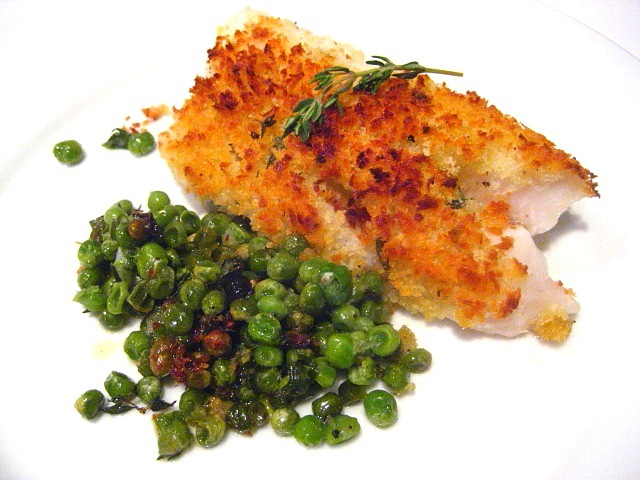 This recipe, another fabulous one from Radically Simple, takes simple cod fish and roasts it on top of a bed of frozen peas. That's right, you heard me, I said frozen peas. You want to keep the peas frozen, so the moisture from the peas helps to cook the fish. Add some extras like scallions, fresh thyme and garlic panko crumbs and this dinner is worthy of serving guests. I doubled most of the ingredients from the original recipe, because 2 cloves of garlic are better than one. Cod is nice and cheap and my new favorite white fish for roasting and jazzing up. Forget Rachael Ray's 30 Minute Meals. This is more like a 15 minute meal. Start by banging the bag of frozen peas on the counter to break them up. 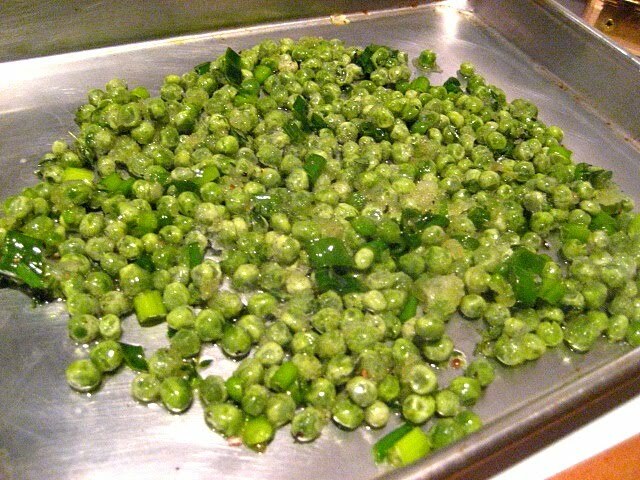 In a bowl, mix the frozen peas w/ the scallions, fresh thyme leaves, salt & pepper. Drizzle w/ about 3 tbsp of olive oil. Mix together and lay out on a rimmed baking sheet. 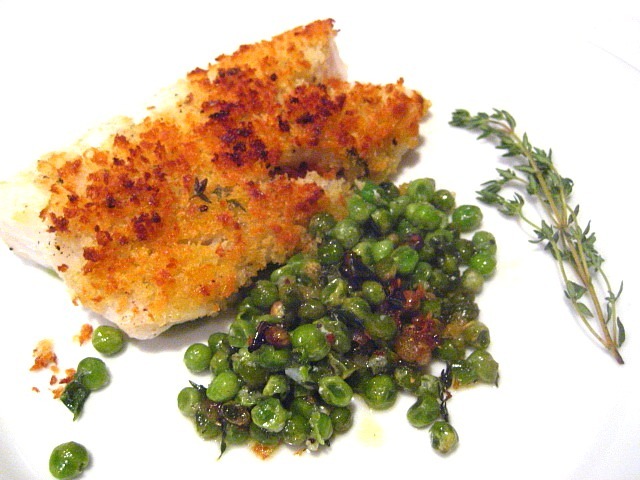 Use the same bowl you mixed the peas in, and mix the cup of panko crumbs with 2 cloves of minced garlic and drizzle w/ 3 tablespoons of olive oil. Toss the crumbs w/ the garlic and oil to combine. 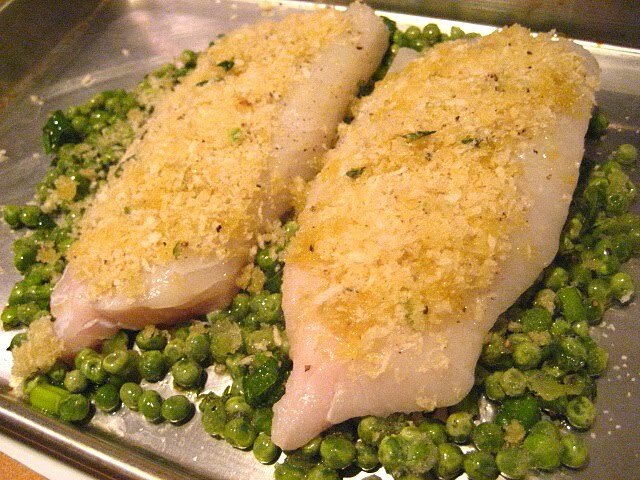 Lay out the cod filets on top of the peas on the baking sheet. Season each piece of fish with kosher salt and pepper. 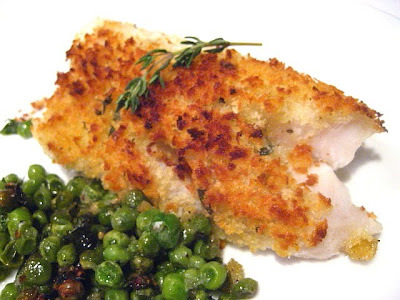 Spoon the panko crumb mixture on top of each filet and pat down w/ your hands to form a coating. I drizzled a little more olive oil on top. Roast in a 475F oven for 12-14 minutes, depending on the thickness of the fish. Open a bottle of Pinot Grigio and enjoy! OK now that is what I call simple, and it looks and sounds yummy!!! Rozanne Gold is so creative. I have several of her books. This looks fabulous Stacey. Simple is best. When I saw the peas, it reminded me of a conversation with my hubby this AM. He said we would have pork stirred fry rice for supper. He asked me if we had some peas and carrots. My husband hates green peas, but I didn't say a word cause I'm hoping he'll start eating them. I'd eat this and his share too. I ate cod twice this week, but not with peas, next time I'll try this. Frozen peas are always a staple in my freezer anyway! More magic from the fabulous alchemist. I love the "Use the same bowl you mixed the peas in..." - so typical Rozanne Gold, ALWAYS sensibly streamlining the process while leading you, in sometimes slightly startling ways ("That's right, you heard me, I said frozen peas")to delicious results. And on top of that, she keeps things on the healthy side, too! I am lazy, so that's why I wrote "use the same bowl as you mixed the peas in" and it gets some of the nice herby garlic flavor when you use the same bowl! I hate washing mulitiple bowls, pans, so you will find I do that a lot. Let's give credit where credit is due! Seriously 15 minutes...that's great as far as I'm concerned. Got to get a copy of this book. 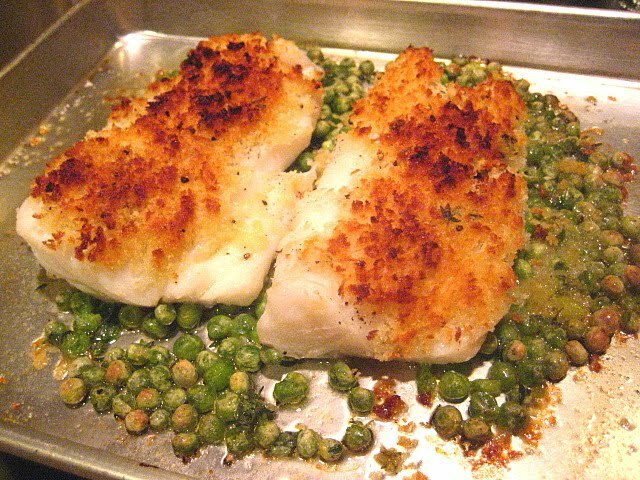 I love cod cause it always makes for such a quick, easy, and delicious meal! I would never have thought to put this over frozen peas. So inventive! All Hail Stacey, the Lazy Queen o' Tarts! If I was allowed in your kitchen, I'd even wash a bowl or two for you. Have to love a recipe that starts with "bang your frozen peas on the counter." And yes, I will be making this. Simple always trumps fussy. Love it! Cod is a favorite fish of mine too. And, roasted peas sound great. I've never cooked them like that before. You had me an panko crumbs. They're a staple in my pantry. LOVE this idea-- so clever. I'm stealin' it! I made a similar fish dish twice this week but didn't use the peas and wouldn't have thought of it unless I'd seen it here first. Wonderful, simple and delicious dish. Stacy, I just love this recipe. Am making it for the third time tonight. A friend of the Ilers', I met you a couple of years ago at their house. I wouldn't expect you to remember, but wanted you to know I'm enjoying your blog. Cheers! Wow is right! I made this last night and LOVED it! You haven't steered me wrong yet. Thanks!